allflex extends its digital printing capacity with HP Indigo 20000 Digital Press for the production of flexible packaging. It’s been announced that the German packaging finishing specialist, allflex Folienveredelung, has installed its first HP Indigo 20000 Digital Press. 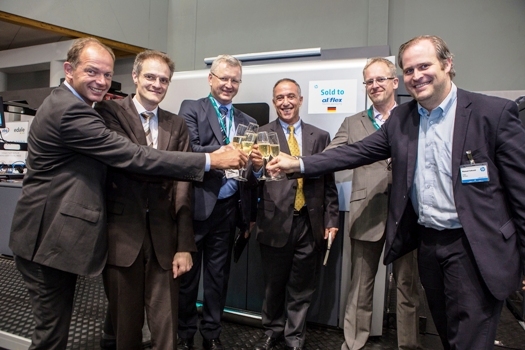 The HP 20000 Digital Press, winner of the 2014 InterTech Technology Award for Innovation, is intended to extend the company’s capacity in digital print production for flexible packaging and shrink-sleeve products on film or paper, alongside its existing competency and technical skills in self-adhesive label printing. The company, founded in 1986, is well-regarded in the flexible packaging market and works with customers across the food industry. The firm also installed an HP Indigo WS4500 in 2009. The HP Indigo 20000 Digital Press is designed specifically for packaging print production. With a printing speed of up to 42 metres per minute, materials like flexible packaging, labels and shrink sleeves can be printed either on synthetics or paper. The machine supports printing production with four, five, six, or seven- colours with the colour technology of the HP ElectroInk delivering a print quality similar to gravure printing. Additional information about allflex Folienveredlung can be found at: http://www.allflex.de/.